Matsubara Naoko was born in Shikoku in 1937, but grew up in Kyoto, where her father was the head priest at the Shinto shrine Kenkun. Her mother is of samurai lineage. 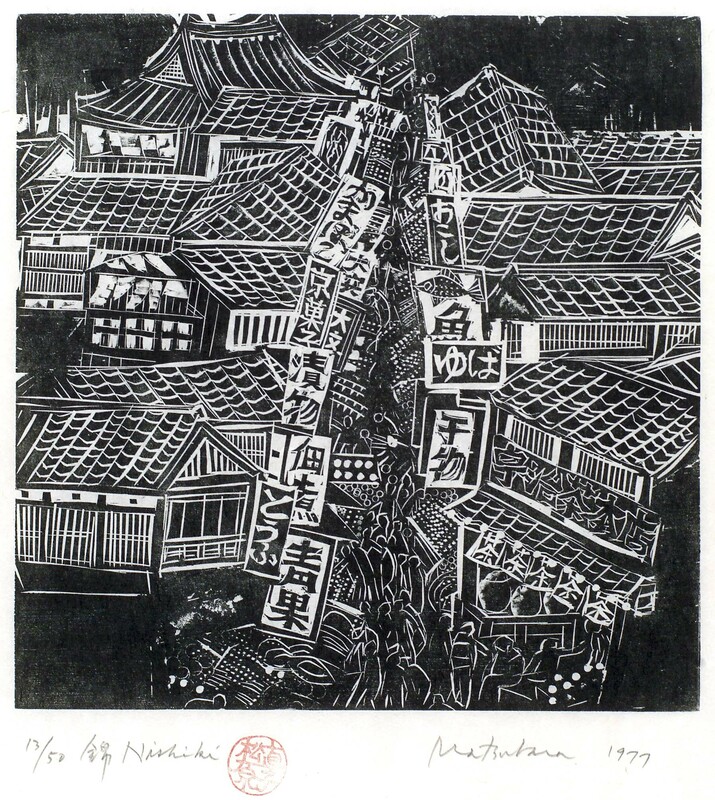 After graduating from the Kyoto Municipal College of Fine Arts in 1960, Matsubara-san left Japan for a Fulbright assistantship at Carnegie-Mellon University, where she later obtained her Master of Fine Art. Afterwards, studied at the Royal Academy in London, and taught at the Pratt Graphics Center under the mentorship of Fritz Eichenberg. One of her earliest professors in college, Frau Professor Lizzi Ueno, encouraged Matsubara-san to work with the wood block directly, letting her inspiration drive her to carve directly and spontaneously into the wood, rather than relying on the traditional practice of pasting or transferring a drawing on the block and then carving. This technique—powered by Matsubara-san’s Shinto based appreciation for nature—results in a dynamism that echoes that of the natural world itself. Her work in wood—done often only in black ink—reflects her love and respect for these simple materials. Today, Matsubara-san actively works in a small town near Toronto, Canada, where she lives with her husband David Waterhouse, a professor at the University of Toronto and an expert on ukiyo-e. Her work continues to have an avid following. 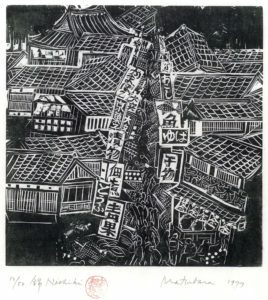 Kyoto Woodcuts, Naoko Matsubara, Kodansha International, 1978. Also, Nantucket Woodcuts, and Boston Impressions. Matsubara-san has created a series of woodcuts for Thoreau’s Walden, published as a limited edition portfolio, and illustrated several children’s books.